A couple of months ago I connected on Facebook with a man who lives out in the U.S. and busies himself making fermented food and drink (and tinctures!) for his local community. I was so impressed with his Facebook posts. His house is more like a health store! Stephen McRae and I got chatting and he told me that he also gives lessons in basic fermentation to members of the local community. I asked him some questions about how this works and also, more about his own story. 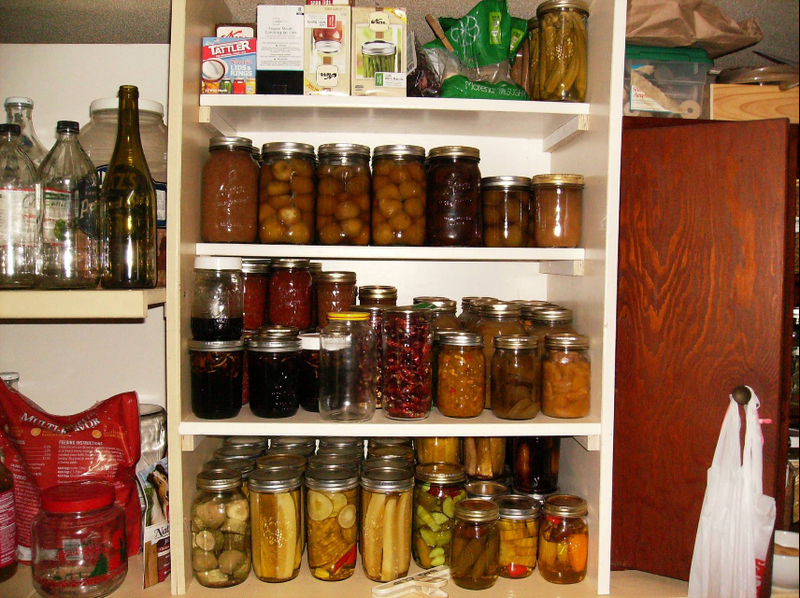 “I’m a single man and have built a huge cabinet to house all of my edible projects. I have turned my life and health around so much that everybody around me wants to know what I did. Several of them are drinking my kombucha, eating or making their own ferments, kefirs. I couldn’t sleep soundly for several years before taking fermented food and drink because of the constant pain I was enduring. Everything the doctors prescribed seemed to make matters worse and something deep inside told me that I didn’t do something soon, I would not be here much longer. I sought the advice of a naturopath and began the year long journey back to health and happiness. “The only things I teach in my workshops are the fermented foods and drinks. I don’t hold cooking classes. The main things are, turmeric tea, Kombucha, and fermenting veggies. I have an advantage over many people, out here where I live, on 50 acres, I have plenty of room to grow my own food. Fruit and nut trees, organic veggies, fresh fish from the 3 1/2 acre pond, fresh eggs, chicken and beef, and I hunt for venison, wild hog, and game birds. I got away from that for a while due to my bachelor status for the last years, but, due to my poor health, I have returned to my roots. Keeps me pretty busy, like now, it is time for me to wake up the chickens!! This is a SCOBY, floating on the top of the Kombucha. A SCOBY is a symbiotic culture of bacteria and yeast. It can be small or multi-layered and they can resemble monsters from the deep, or aliens! 😉 … But they’re the ‘mother’ of the Kombucha and the source of all its goodness. A Cupboard full of Pickles. The crinkly looking red veg in a jar in the centre of the photo are cayenne peppers, vacuum sealed in jars. The darker pint jars in front are honey onion cough syrup, made with raw organic clover honey. As fabulous fermenters know, if you’re taking lots of fermented food and drink, you shouldn’t be needing a cough syrup (!) but Stephen is the angel of his community and not everyone has yet converted, so a natural remedy is far better than taking drugs. Vegetable ferment water takes on the colour of the veg in which it’s fermenting, so you can be gifted with beautiful red and purple fermented water. This is the stuff that I drink if I feel a sniffle coming on. I’ve had 3 teeny sniffles in 15 months and none has developed into even a cold! Stephen ferments Kiwis and Strawberries to flavour his Kombucha. As you know, Kefir is my favourite baby. Kombucha is made with a mix of green, white or black teas and then flavoured with fruit, to make it less bitter. I’m not a fan of tea or caffeine, which is why I’ve avoided it to date, but it’s a drink that goes back 100’s of years and has proved it’s worth in native communities in various pockets of the world. Stephen sent me a couple of mails that detailed how he ferments some of his food and drink. It’s always interesting to compare notes! I discovered he has settled on ginger as a good starter, as I have, but we also like to do other processes in quite different ways. Stephen uses fermented ginger as a starter culture. Funnily enough, so do I! I just decided one day that rather than ferment fruit in water and salt, I would start with fermented water, taken from the jar where I’d fermented a pile of ginger .. and add filtered/mineral water to that. It gives the fruit a lovely extra zing and I prefer it to using plain water. Stephen uses airlock lids, but not with all ferments. As those of you who have been reading this blog will know, I’ve stuck with simple clamp down jars, so am unable to say whether or not it enhances flavours by using an airlock lid, but I’ve been very happy with the taste of my ferments and space-wise, it’s much easier using flat-topped jars. I’m happy to clamp down a lid, but Stephen uses a traditional method of using glass weights to submerge food in the water. I use a cabbage leaf with vegetables and with fruit, I just keep an eye on the surface. Fruit rises quickly (all ferments will rise in water) but I’ve yet to see any mould in a fruit ferment, so I take the easiest route of using nothing but a lid! Stephen finds that his fruit takes 5-10 days, out of sunlight with 2 tablespoons of starter and a pint of blueberries. I’ve found that blueberries on their own take longer to ferment than when mixed with raspberries and blackberries. Softer fruits break down quickly and seem to speed up the entire fermentation process. Ideal temp Chez Mr McRae is 72-75 degrees Fahrenheit. Chez nous in the UK, I ferment everything in our small utility room that can reach temps of over 80 degrees. I just need to keep an extra check on them for that reason as they can move pretty quickly once they’re running and can change from not ready to over ready, seemingly in the blink of an eye! When flavouring his Kombucha, Stephen lets the fruit sit in the Kombucha for 2-3 days. It’s a process that gives the tea a little more fizz. Like a soda pop. This is called: Second Fermenting. The measurements he uses are 2 tablespoons of pureed fruit to 16 oz of Kombucha. I do this with cow’s milk kefir now, for my husband, but that only needs a few hours at most and would still flavour in the fridge, but at a much slower rate. Remember: Heat speeds up fermentation. Cold slows it down. Ultimately, adding a fruit to Kombucha adds the fruit’s own vitamins to an already powerful probiotic drink and doubles the health benefits. Comparisons of fermentation loves and techniques from a fabulous fermenter across the pond. So much fun to learn about how someone else bubbles away their veg and drinks! I hope this story will encourage you to look back at our kefir series and also recipes that appeal on this blog to date and take THE PLUNGE! Please let me know in the comment box below which type of ferment appeals to you the most. Almost anything can be fermented, but if you stick with any of the four above, you’ll be making a great start! An interesting read 🙂 What is the easiest way to get into trying fermented foods without doing it yourself? I haven’t seen kefir in the shops but I have seen a drink called kombucha – is that a good enough ‘in’?. A lot of my clients are super-busy and will want to buy it I suspect. Hi Tricia, thanks for your question. I’m going to have be really honest with you! I have never looked for fermented food in a shop! When someone first suggested to me that I get to know about fermented food and drink, including kefir, I went straight home, started reading on the net, bought some kefir and veg culture starter and started making my own. I know that at least one leading UK supermarkets sells kefir, but bear in mind that when you buy, that they may have other ingredients that aren’t favourable or necessary. Kefir seems to have had the most scientific research to date and can give testament to it’s benefits. I find it indispensable. Look at Stephen’s story in this thread and how kefir has made such dramatic changes to his life! Helen, your reply is music to my ears! Please do read Stephen’s responses this morning. They’ve just published and tell an incredible story about kefir! I am running a workshop on Wed 19th November from 7pm. Would you like me to email you about it? One more thing, I only use my fermented ginger (the juice from it) in the fruits that I ferment. I use Caldwell’s culture starter in all my fresh veggie ferments. I have been successful in making my own yogurt, so, two weeks ago I struck out on a new adventure, making my own kefir. Something amazing has happened I need to share. I have been working out with weights and plank exercises and at my age it seems it takes longer to recover. Already in the two weeks I have been drinking kefir it cut my recovery time in half. So, now I am investigating the mysteries of kefir versus the other ferments I consume, why does the kefir cut down recovery time and the other ferments didn’t. The only cultured vegetable that seemed to help in speeding up recovery was my fermented kale. However, it still didn’t do what the kefir has done. I do a 30 to 45 minute intense work out and at 58 years old it takes two days to recover, now I can add one or two more work-outs a week. For those who are familiar with weight training recovery time is very important. You stretch and tear down the muscles then you have to let them heal to increase and maintain muscle mass and strength. Needless to say, I have already increased my kefir production, I have a goal to meet for my 60th birthday. Bigger, better, stronger, faster than I have ever been in my life, and most importantly, healthier. I only use ginger for fruit. I use a different starter culture for my cucumber pickles and ferment the rest naturally now. I find them very effective that way. I use the fermented water as a drink if I feel a sniffle coming on very occasionally and it stops it in it’s tracks almost immediately! Like you though, I have found kefir to be more powerful than veggies regarding healing. They both have benefits, but kefir is just something else. SO great to hear this new story from you! VERY exciting. Please keep me posted. It doesn’t surprise me. It has healed many things for me and I am, consequently, totally in awe of it! Thank you for sharing my experiences and techniques. When I started this I never thought that someday I would be helping others or teaching others how to command their own health. You asked about the infusion of the fruit flavors into the kombucha. I have bought kombucha from a health foods store that had chunks of fruit in them, they are very soft and some folks seem to have a bit of a problem with mushy particles floating around in their drinks. My main goal is to get people to drink it for their health, so, I have experimented with different ways to make everything more palatable. Putting the fruits in the blender and adding to the tea made it look more pleasing, and in the process I found that this really enhances the flavor of the fruit used in the kombucha verses just putting a few pieces in the tea. Also, it helps in the second ferment stage, the fruits are already broken down in liquid form and takes less time to get that appealing fizz like a soda pop. I also experimented with letting the fruits ferment for at least a day or two before adding it to the kombucha, again speeding up the second ferment process. For me, time is of the essence, and anything I can do to speed up the process helps me get it to my customers faster. I shall be using your techniques very soon Stephen! Thank you for sharing this with readers. Pleasure to share your inspiring story! Very inspiring ! Thanks for sharing Sarah, I do enjoy your posts and your sense of humour & fun ! Thank you Ele! Lovely to have you on the blog. Wow. So interesting and impressive, Sarah. It is a treat to see the photos! And thanks to Stephen! He’s amazing, isn’t he?! So glad you enjoyed the post. It was great to share his story Vidya.